Natural bentonite clay was used in the synthesis of single and mixed oxide Al/Zr pillared clay catalysts by means of ultrasonic treatment during the aging and intercalation steps. The raw bentonite and pillared clay catalysts were characterized using high resolution scanning electron microscopy with energy dispersive system (HRSEM-EDS), powder X-ray diffraction (PXRD), N2 adsorption/desorption, Fourier transform infrared spectroscopy, thermogravimetric analysis, cation exchange capacity, zeta potential and all the catalysts evaluated in the catalytic wet air oxidation (CWAO) of phenol. 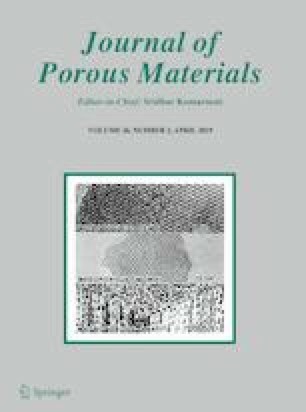 Calcination of the synthesized Al/Zr-PILCs at 500 °C for 120 min yielded optimum physical properties with BET surface area of 230 m2/g, pore volume of 0.115 cm3/g and basal spacing of 1.92 nm and with good thermal stability. Complete removal of phenol was obtained after 120 min and 88% TOC was removed after 180 min in aqueous solution under mild reaction conditions of 100 °C and 10 bar after. Catalyst reusability studies showed that the Al/Zr-PILCs catalyst demonstrated excellent chemical and structural stability with insignificant leaching of Zr4+ after six consecutive catalytic runs. The Al/Zr-PILCs catalyst therefore demonstrated excellent catalytic properties in the CWAO of phenol in aqueous solution. The online version of this article ( https://doi.org/10.1007/s10934-018-0667-3) contains supplementary material, which is available to authorized users. The authors wish to acknowledge financial support from the National Research Foundation (NRF)/Department of Science and Technology (DST) of South Africa under Professional Development Programme (PDP) Project No. 96719 and Mineral Science Council of South Africa (Mintek) under CWO of Wastewater Project No. ADE 164.